I kinda can’t believe it since here in Minnesota we were all “April Blizzard” a minute ago, but you guys, it’s totally here. And I totally had it for dinner last night. and smoky chipotle grilled chicken! REPEAT: GRILLED! Heya! FYI, Book links are Amazon affiliate links. This dream team of ingredients better known as a Summer Chipotle Chicken Cobb Salad is coming to our hearts today from the What’s Gaby Cooking Cookbook. Remember when I published those BEST EVER chicken tinga tacos and told you about my friend Melissa’s amazing book and then talked about how I hardly ever promote books? But then I turned around and told you how great THIS one was, too? LOL to me. It’s just dumb luck that both of these came out when they did. We’re not paid for any cookbook promotions – I just like to show you the ones that we like and give you a sneak at their best recipes. And this one is one that I like. And this might be one of its best recipes. Tied with the cilantro vinaigrette, which I couldn’t not use again for this salad. I know Gaby says to use the champagne vinaigrette with this salad, but GABY COME ON YOU CAN’T TEASE US LIKE THAT. One good lick of that cilantro dressing and you’re done. Goodbye. This is your life now. The more “involved” part of the recipe (if you can even call it that) is just plopping your chicken in some spices and a few chipotle peppers and letting it marinate for a while before grilled. WORTH IT, you guys! So worth it. Also probably more normal to take a picture of the grilled chicken rather than the raw marinated stuff, but who said anything about normal. Bjork and I ate this salad on the deck on a random Tuesday night and we both mega-loved every lip-lickin juicy bite. It’s a little spicy, a lot crunchy, and those bites of sweetness in between are so super rewarding. Thank you, Summer Chipotle Chicken Cobb Salad, for making all our dreams come true. This juicy salad tastes like summer! With chipotle chicken, sweet corn, avocado, cilantro vinaigrette, bacon crumbles, and fresh strawberries for a pop of sweetness. Recipe republished from the What’s Gaby Cookin’ cookbook! Prep the chicken: Combine the oil, chipotles, garlic powder, cumin, oregano, black pepper, and salt in a bowl. Place the chicken in the bowl and toss to coat the chicken in the marinade. Place in the fridge and let it marinate for at least 1 hour. Grill the chicken: Heat an outdoor grill (or grill pan) to about 400 degrees. Place chicken on the grill and grill for 5-6 minutes per side, until cooked through. Remove the chicken from the grill and let rest for ten minutes. Slice against the grain. 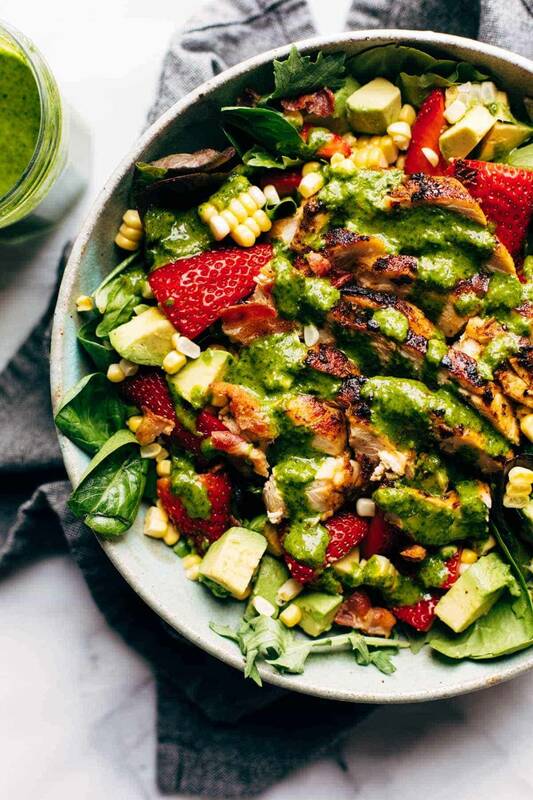 Salad: Arrange the greens on a large platter and top with the bacon, strawberries, corn, avocado, and grilled chicken. Season with salt and pepper. Toss with the cilantro vinaigrette and serve! Greens: We used spring greens in the pictures on this post, but we love this with just spinach too depending on what you have on hand! Nutrition label does not include the Cilantro Vinaigrette – head to the recipe to find its nutritional information! Holy moly, that looks good! Can’t wait to make it! This looks soo yum! and that salad dressing sounds heavenly! This looks SO good! Also, I love your write-ups. They always make me smile. I’m guessing you could probably substitute parsley instead? Different flavor profile obviously but I’d think it would work. Erika | Isaiah Design Co.
Michigan totally had the strange “April blizzard” fiasco too! But yes, summer has come! Wonderful recipe. Could you give an alternate method for cooking the chicken indoors, please? Sauteing in a pan on the stove should work just fine! This sounds awesome! I was just wondering what to serve for book group on Thursday. This is it! Thank you!! Glad to hear that, Nancy! Is the corn raw off the cob? Yep! 🙂 Feel free to cook/saute if you’d rather. Thanks! I was wondering the same thing! I just made this-sooo yummy!!!! Healthy, tasty, and comes together pretty quick! Chipotle chicken, yum! SO much flavor in this salad!! I love everything about this!! Screaming summer and I’m all about the different textures and a filling “meal” salad. This fits the bill! Made this recipe exactly as written and it was absolutely delicious! The cilantro vinaigrette with it was such a wonderful summer meal. Love your recipes thank you and congratulations on your growing family! Glad to hear that, Allie! I made this salad last night and it was unbelievably good! All the best things going on in there! Glad to hear that, Victoria! This was absolutely awesome! I did grill my corn first. Also, the hubs can’t have strawberries so I figured mango or pineapple…I used mango, grilled it first too, and it worked great! Thank you so much! That dressing rocks! I adore corn in summer salads — and strawberries — and everything about this! Bring on the heat! Faaaaantastic! Smoked the chicken thighs instead of grilled the chicken but either would be awesome. Dressing is amazing! Also I wasn’t sure if the corn should be cooked so I smoked it after the chicken was done. Love this! Where is the flat bread from? Homemade or just regular ol pita? Love this idea so much that I made these for lunches this week (without the bacon). Delish! Also, I think you may have forgotten to include the notes section! I’m not sure if it’s just me or not but I’m not able to see the nutrition information on my chrome mobile browser. I’ve been looking and looking for it on your recipes lately and just tried it in Firefox and there it is! Would love to know if it’s just a setting or something. Seems like it’s getting covered by ads. Hi Ashley! Sorry to hear that. I just checked on our end for Chrome on mobile and it’s appearing just fine. If you run into more issues with seeing labels, feel free to reach out to me at [email protected]! Any chance you can add the notes to this recipe? Thanks! Your pictures look so great. I have Gabby’s book as well and have already tried this recipe. It’s fantastic. The chipotle flavour goes so well with the strawberries. this recipe is exotic.I like it. This looks delic!! Perfect for the warm weather finally arriving! Bring this recipe to 6 stars by adding feta and chives then wash it down with Whole Food’s Blood Orange Italian Soda. Soooo good my 2yo ate an adult size portion and I didn’t notice because I was in salad dream land. Made this (with 2 chicken breasts and 3/4 of the dressing) and it was delicious! Can’t wait till peak corn season so I can make it again!